Last week the Commerce Department released its revised numbers for Quarter 2 GDP. The results were much less than satisfactory, with annualized ‘growth’ coming in at a pathetic 1.0%. Think of this as an economic stall speed. We know the GDP deflator allows the metric to be overstated to begin with, so it is VERY likely that America has re-entered the ‘great recession’ as it has been dubbed by the media. There are some burning issues in here that need to be discussed and they go way beyond the methodology of how GDP is calculated. I will end with the assertion, backed with output methodology, that is at least as reliable as what the Commerce Dept. offers that we never left the great recession. Ben Bernanke, the official spokesman for Bankers, Inc. was quick to pontificate from Jackson Hole Wyoming that the second half of the year bodes very well for GDP and economic growth in general. This is where the shuck and jive starts. What nearly all commentators are missing here is that USGovt borrowing nearly ceased in the second quarter. On the surface, that might look positive, because it would indicate that a greater percentage of that 1% growth was real; that the economy was actually able to stand on its own, if even in a very small way. This is where the price deflator comes in. The GDP price index came in at a very tepid 2.4% in the second quarter of 2011 after coming in at 2.3% in the prior quarter. This number is a complete fabrication in that it certainly doesn’t properly discount the impact of price increases experienced on Main Street. Inflation metrics have been understating inflation for years in order to rip off transfer payment recipients. For example, the last SocSec cost of living adjustment came three years ago. Does anyone believe that the cost of living has remained unchanged in 3 years? The CPI, Core CPI and GDP price index have been manipulated to discount inflation and by definition, to overstate economic growth. Failing to properly discount for inflation is more than likely responsible for all of the 1% growth experienced in Q2 – and then some. I’ll provide more substantiation for that opinion a bit later. Now the second part of the shuck and jive. Bernanke and everyone else knows what happened when the debt ceiling was raised. The government went on a borrowing binge, adding around $400 billion to the public debt within days of the bill’s signing. This bolus of new debt was pumped into the economy, and will go right into Q3 GDP calculations. When Q3 GDP shows a boost, Bernanke will get up in front of Congress, smile, and talk about how the Fed’s policies actually work, how government action is the best way to generate economic growth, and, by the way, please give us more power to create even better GDP results moving forward. Washington politicians who are hooked on the idea of a centrally planned economy will do the same. Think I’m cynical? Watch what happens. The overall lack of jobs will only be of minor concern, but enough to likely justify another ‘stimulus’ attempt at some point before the elections next year. They’re already cooking up something to bail out underwater homeowners, calling that a stimulus. Let’s go out a bit further. There is now an economic kill-switch built into our economy in the form of massive (and allegedly mandatory) spending cuts. These cuts need to be agreed on and passed before Thanksgiving or else automatic cuts will be triggered. So either way, some of the cookies and candy ought to be coming out of the equation in Q4. Has anyone noticed that very little attention was given to this reality? The debt ceiling deal has long been forgotten and we haven’t felt even a single nudge from the negative consequences yet. So we see a boost of GDP in Q3, and likely Q4 as well from the increased borrowing. The massive budget deficits are still firmly in place and are being built on daily. Once the mandatory cuts take place, GDP drops, depending on the timing of the cuts. However, it is very likely that through manipulation of the GDP price index, that an official recession will be avoided – in governmentspeak at least. The entire notion of including government spending in economic output is tainted to begin with. Mainline economists will argue that it must be counted since the dollars are real and end up on Main Street where the vast majority of them are spent into the economy. My assertion would be that if the government butted out and left the dollars on Main Street, they would be spent anyway, and horror of all horrors, some might actually get saved. Keynes was quick to point out the evils of savings, though, and his followers are quick to maintain the tradition. If mainstream economists can make a case for including government spending in GDP, how about when half of that money is borrowed? Count it anyway, they say! Never mind that the debt must be paid back with interest, thereby reversing the infusion (plus a little extra for interest). There are plenty of folks who will quickly point out that ‘by accounting definition, borrowing makes us rich since the money goes into the economy’. You guys know who you are. You never tell anyone about what happens when the money must be repaid though. These folks are following Keynes to the letter – forget the long run – it doesn’t matter. Unfortunately, GDP numbers are used in many financial activities, from capital spending decisions to financial asset purchases. Distorted numbers lead to distorted assumptions, which lead to bad financial decisions. Is it any wonder that corporate debt is at an all-time high? These folks are borrowing money in anticipation of a boom that never arrives. Granted, GDP isn’t the only metric they use, but I spent enough time in budget meetings to know that it is the biggie when next year’s budget allocations are on the table. Those seeking to purchase financial assets often look at GDP for an insight as to how a particular company might fare in its quest for increased profits. A solid economy is likely to generate better profits, thereby increasing stock prices, etc. I don’t need to lay out the rationale; everyone understands it. Perceptions about the economy play into many other consumer decisions as well, although one thing I am noticing is that people are paying less attention to government numbers than they are to their own personal economic realities these days. This is one of the reasons why consumer confidence can be at recession levels despite the fact that the government doesn’t own up to it. One thing a flagging economy also tends to do is drive people out of stocks and into bonds. This action lowers interest rates and allows the government to borrow money more cheaply. In that regard it is certainly in Washington’s interest to keep the idea of the never-ending recession going. Phony GDP numbers prevent accurate price discovery in the bond markets, although, admittedly, this isn’t nearly the issue it was a few years ago. Back then there was actually a bond market, as opposed to now where we have a group of primary dealers laundering bond market monies for the fed and little in the way of other activity taking place. In a normal world, the fed wouldn’t have to conduct all these illicit bond-purchasing activities. The recession would do it for them, driving investors to grab USGovt debt in a flight to safety. However, the magnitude of USGovt borrowing has overwhelmed the savers of the world. Erosion of confidence in the dollar hasn’t helped matters. The realization that the US will never get its house in order has prompted savers around the world to seek out other safe haven assets, notably commodities, which people are learning don’t come off a printing press. The recently passed debt deal and the plan to switch to a chained-CPI are two landmark initiatives that lay bare the intentions of the powerbrokers to keep the Ponzi scheme going a little while longer. With these matters in mind, one of the items of high priority should be discovering an authentic measurement of output. There will be no perfect measurement, since the definition of output varies depending on whom you happen to be conversing with. So I’ll frame this part of the essay by stating that my goal in seeking an alternative was to find a measurement that allowed capital, labor, and productivity to assume their proper roles in the determination of output. My earlier assumption that government shouldn’t be in the economics business means that I will not count any government spending in this definition of output. Government monies either arrive by taxation or borrowing. Taxed dollars would have stayed in the economy anyway if they hadn’t been taxed out of it, so there is no reason to count the taxed portion of government spending. 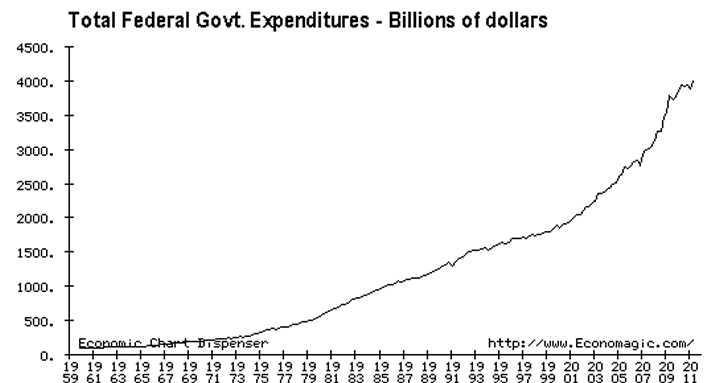 There is definitely no sane reason to count the portion of government spending that arises out of debt accumulation. It must be paid back and constitutes a drag on future output. I also believe that corporate debt and bailout dollars don’t represent authentic capital and cannot be used to determine output. These are my biases; I’m being forthright and honest about them, rather than trying to use subterfuge to cover my motives. That said we could simply revise the existing GDP formula to exclude all government spending and be done. That would be one way of doing things for sure, and people have done it. Another way would be to take labor and capital inputs, understanding the relationship between the two as they relate to output, then adjusting for changes in multifactor productivity. The Cobb-Douglas output function is a rather simplified way of doing that. I am not going to get into the nitty-gritty of the methodology in this article, as this is not the forum. Frankly, we have subscribers and clients who pay good money for this information and there is way too much work involved to just hand out anything recent. 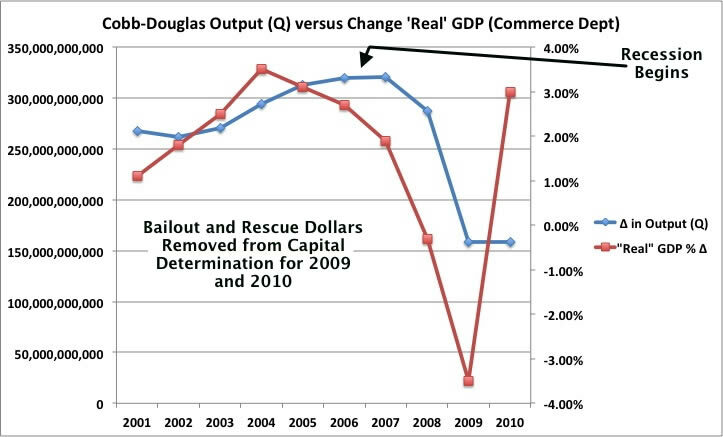 What I will do is provide the graphic below and submit to you that (and I have said this many times) the great recession began in late 2006 – a year before my original call of the recession on 11/25/2007 - and has yet to end, despite what the Commerce Department has to say. This in itself should not be an earthshattering statement; it dovetails with what so many of you are experiencing. The real value is that we have empirical evidence to connect with our perceptions. Better yet, we have another tool in the toolbox for making financial and economic determinations. There is an old adage that figures lie and liars figure, and I am sure there are those of you that will call me the latter because this empirical evidence doesn’t match up with your particular worldview. That is fine; the traditional measurement of GDP certainly doesn’t match up with mine – or the vast majority of Americans.